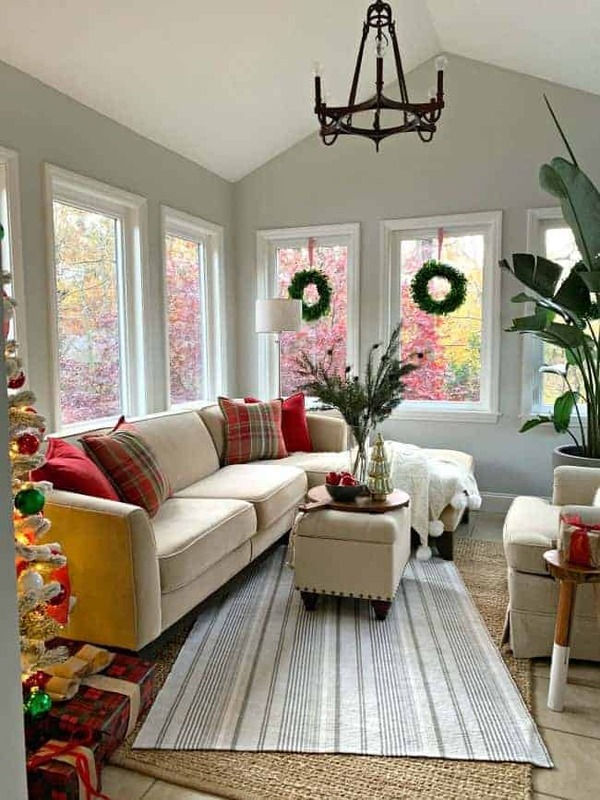 A tour of our cottage Christmas sunroom dressed in traditional holiday colors. I already shared my first Christmas craft, DIY orange slice ornaments, last week so today we’re kicking off the Christmas decorating season in our cottage sunroom. 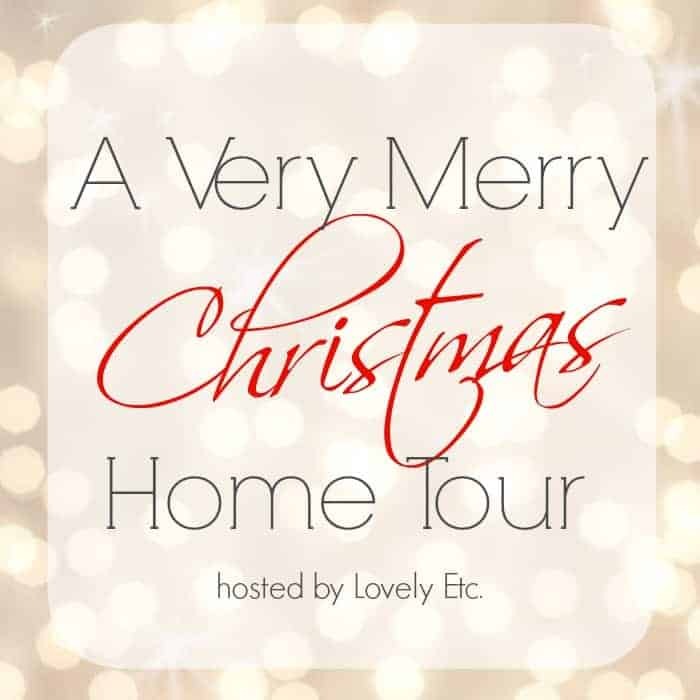 I’m thrilled to be joining Carrie, Lovely Etc., for her Very Merry Christmas Home Tour today. 26 talented bloggers will be sharing their holiday homes and decorating tips all this week so you know they’ll be lots of great holiday decorating inspiration. You can check out the links at the bottom of the post and visit your favorites. You can also find a source list for this space at the end of the post. So…let’s get this holiday party started in our cottage Christmas sunroom, which is all dressed up in traditional red and green. I am so excited to share this space today. I’m not just excited…I’m super, duper excited. Ok, maybe I’m being a bit dramatic. I just never thought that I’d be able to fit a tree in this small space. As you can see, we were able to squeeze one in…and it’s flocked. I’ve always wanted a flocked tree and this one doesn’t disappoint. This room started out as a catch-all for our boxes and other junk when we moved in over 2 years ago. A lot of cleaning, a bit of paint and furniture has turned it into our favorite space to relax. There’s no tv in here, just the sights and sounds of nature that we can see right outside the windows. It’s even better with the new tree, though. The glow of the lights at night really draws us out in. We love it! This is the first flocked tree that we’ve ever had so it took me a little while to figure out how to show it off. I left it bare for a week and really enjoyed it like that but, in the end, traditional red and green struck me as the right way to go. I did go light on decor though with just a bit of shiny red, green and white to give it a festive touch. The main attraction for me is the flocking so I didn’t want to cover it all up. I added a bit of red ribbon and red berries to make things interesting but that’s about it. Simple but festive. 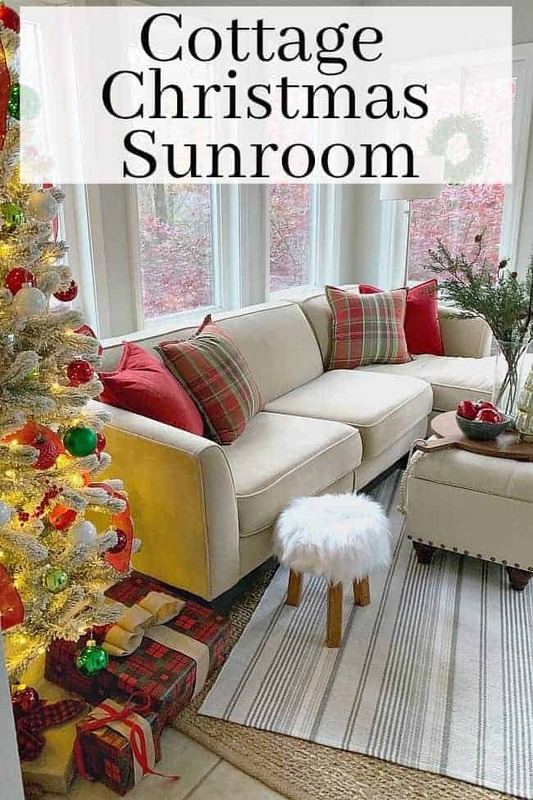 It’s the perfect holiday addition to our small sunroom. 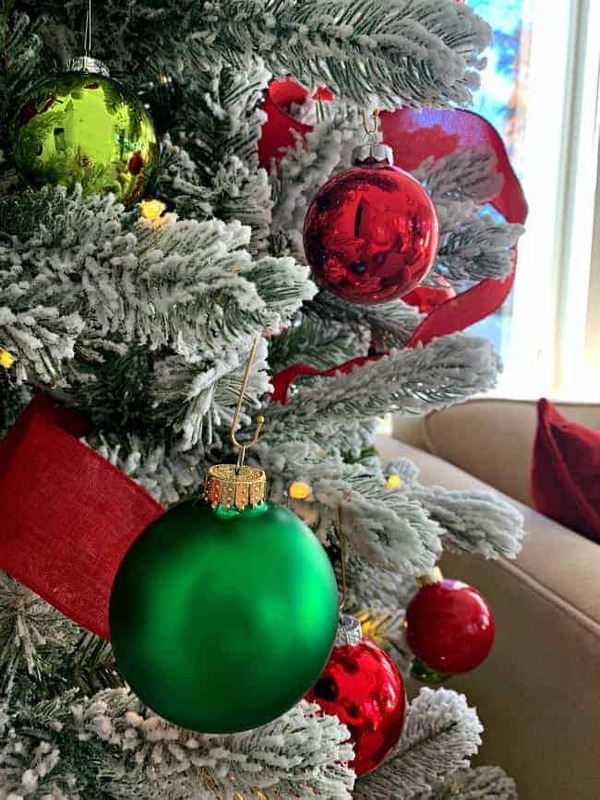 The rest of the room has touches of red and green sprinkled throughout. Like I said, it’s a small space so there wasn’t a whole lot I could do. I did add a trio of boxwood wreaths in the windows that you see as you enter the room. Once the leaves fall off the trees it’ll be nice to have the green of the wreaths to look at. And how about a shout-out to Ethel (our Bird of Paradise)? She’s magnificent all by herself. No decorations are needed for this lovely lady. You go, Ethel! That’s a wrap for our Christmas sunroom decor for this year but there’s plenty more to see. We have the kitchen, dining room and living room all dressed and ready for the holidays. I went in a different direction with these spaces and I can’t wait to share them with you. My friend Julie, Redhead Can Decorate, is up next on the tour. 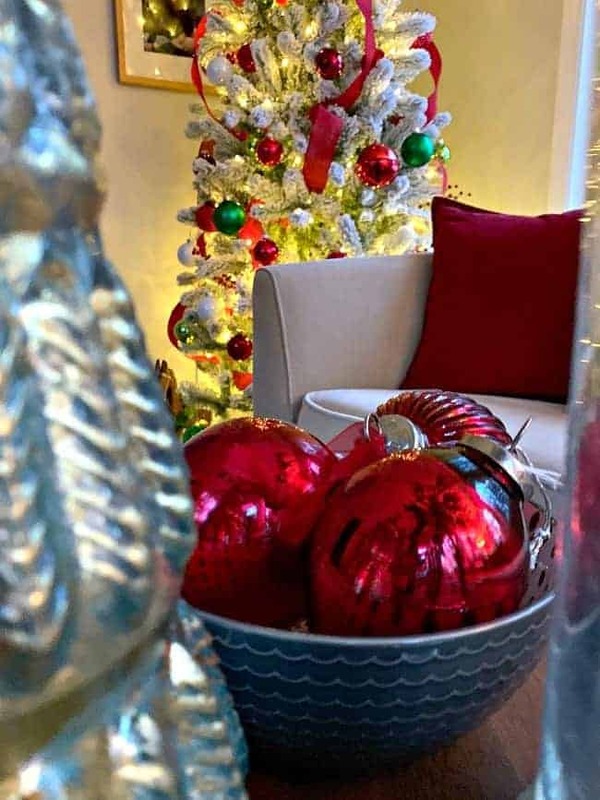 She always has a beautiful holiday home so make sure you hop on over and check her out. What a pretty space! 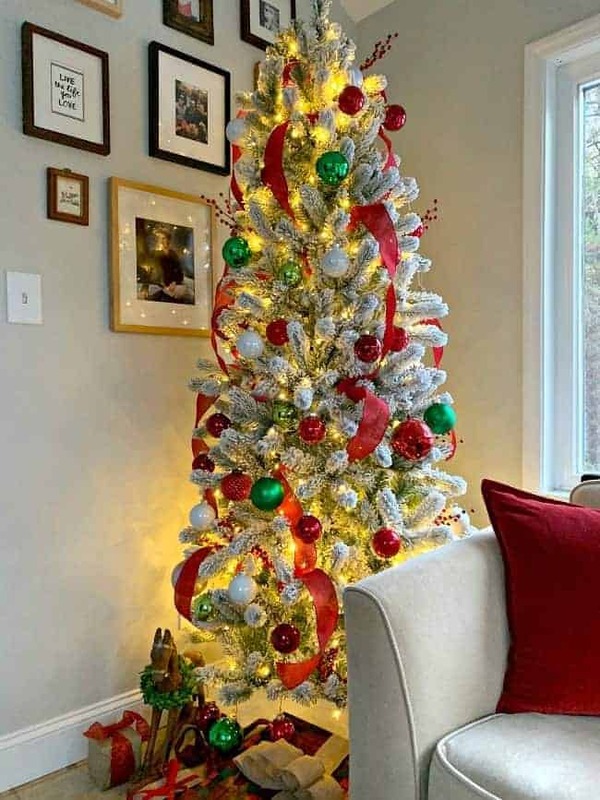 That tree is just perfect for that room! This is such a beautiful, peaceful space! 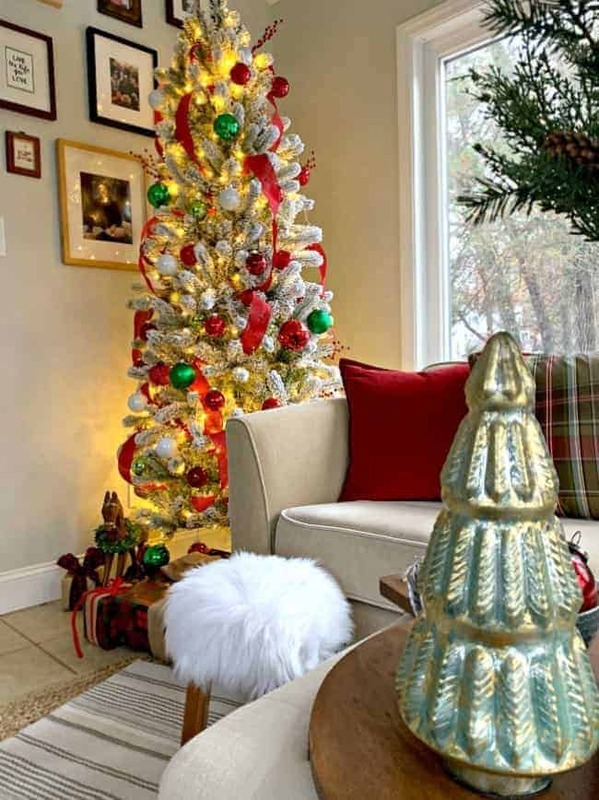 I love the flocked tree and your simple Christmas decor – what a great room to sit in relax in! Thanks so much Carrie, I appreciate it! We really do enjoy hanging out in this room and it’s so nice with the holiday decorations. Love the flocked tree! Someday I’m going to have one! Lovely room! Thanks so much, Gretchen! I’m really loving the flocked tree and it was fun to decorate. 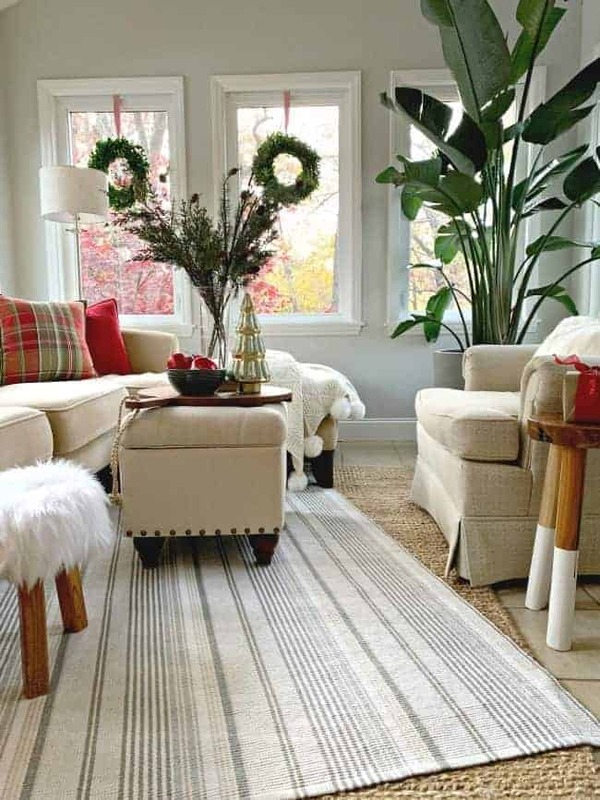 It looks great, the boxwood wreaths are a perfect complement to the festive decor. 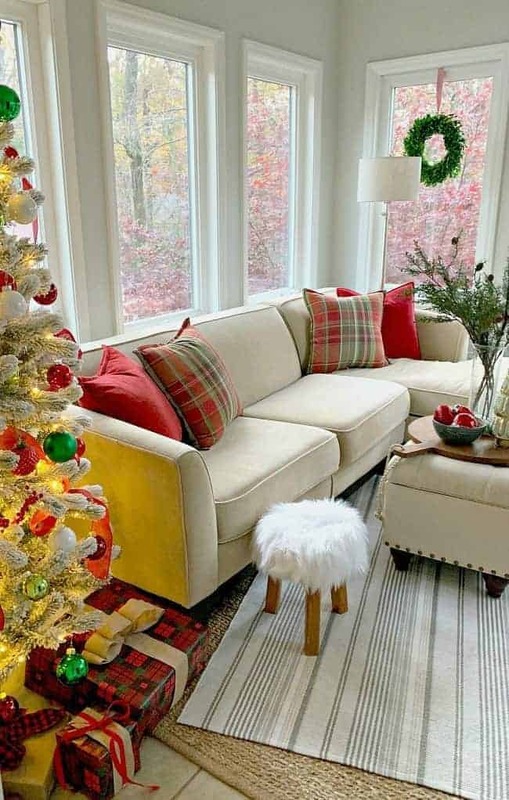 and tartan/plaid is always on my lists of favorites in home decor. Thanks so much Pat, I appreciate it! I love all the red and it’ll still feel festive after the leaves fall off the trees. You don’t need much decor when you have those beautiful red “Christmas” leaves outside still on the trees. Your room looks amazing and I love the traditional red and green for this room – again, how can you ignore the red leaves outside the windows. It’s all perfect for this particular room at this particular time. A happy accident but they are perfectly red at the perfect time. Thanks so much Pat! Mother nature cooperated with the red leaves on the tree. Perfect view for a perfectly cozy room. She knows what she’s doing, that Mother Nature. 😉 Thanks for stopping in. It is a pretty awesome view. Thanks so much Terri!